Powers/Abilities: With his augmented strength and regular exercise and weight lifting, Dunphy has super human strength and is capable of lifting up to 15 tons. Dunphy has undergone extensive training as a wrestler and as partner to Captain America. His strength was once pushed beyond the ability of his heart to sustain, but was later restored to its standard augmented levels. For unknown reasons, Dunphy was able to be preserved for months in a block of ice, but he is now slightly brain-damaged and sometimes delusional. Dunphy is accustomed to operating the Avengers Quinjet and handles a motorcycle well. 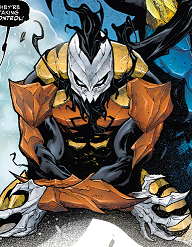 D-Man was briefly infected by a modified symbiote, giving him a yellow-and-brown symbiotic costume and enhancing his strength; after being infected by a Poison, altering his costume with a white exoskeleton, making him part of a hive-mind. 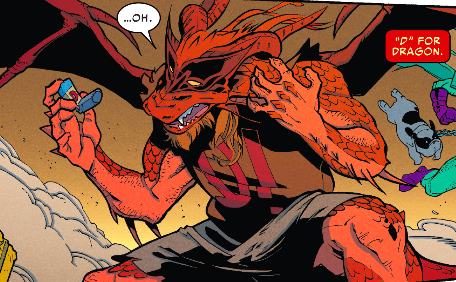 D-Man was temporarily turned into a dragon-man capable of flight and breathing fire, through a serum made by Doc Jaw. (Captain America I#328 (fb)/Thing I#28 (fb)/Thing I#35 (fb) - BTS) - Dennis Dunphy played football in college and desired to go professional after graduating, but was turned down by several teams. Realizing that he wasn't good enough, he continued going to the gym with the hopes that his chance would come along; he worked on production lines in Detroit, Michigan to support himself. He was offered super powers by a man at the gym, so Dunphy contacted the Power Broker, who augmented Dunphy's strength with radiation, then convinced Dunphy that he would need regular stabilization pills to avoid his powers from making him constantly sick. Dunphy realized the risks that these new powers would pose, but wanted them bad enough to risk it. He turned down job offers and went back to try out for football, quickly realizing that he was too strong to play now. He continued taking his stabilization pills as scheduled. (Thing I#28) - Ed Garner held tryouts for the Unlimited Class Wrestling Foundation (UCWF), a new wrestling league pitting super-powered wrestlers against each other. Dunphy attended the tryouts alongside the Mangler, the Thing (of the Fantastic Four) and several hundred others. When Thing lifted the highest amount during the weight lifting requirement, the others were intimidated, but Dunphy stepped up and matched the weight, though he struggled to do so. Though all knew this was not the Thing's maximum strength, Dunphy was accepted into the league alongside 14 others, including Mangler and Thing. After weeks of training, the numbers were brought down to 12. On opening night, the star match pitted Thing against Dunphy, who'd taken the name Demolition Dunphy. Garner tried paying Dunphy off to throw the fight, but Dunphy refused the money, even though he was considering throwing the fight for the good of the league (having a member of the Fantastic Four win early on). Thing told Garner off for this, however, and Dunphy agreed to a fair fight. Two weeks later, Dunphy and Thing fought. Though Dunphy was more athletic and had more diverse moves, Thing's strength won out. They hit each other in a full speed collision off the ropes and Dunphy was knocked unconscious. Thing was the winner. (Thing I#29) - Weeks later, the UCWF were having a tag team match in New Orleans. On Dunphy's team were Thing and Blacksmith, and the opposing team included Jersey Devil and Swami Riba. A former wrestler seeking personal glory named Gator Grant interrupted the fight and the UCWF wrestlers ganged up on him. 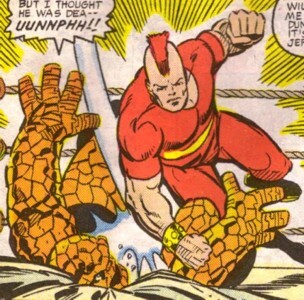 Gator told Thing about the origins of his powers as they fought and the Thing defeated Gator. (Captain America I#15 (fb) ) - Edward Garner arranged a fight between Demolition Dunphy and "Lightning Lemar" Hoskins; though Garner asked D-Man to go easy, he humiliated Hoskins instead. (Hulk vs. Hercules: When Titans Collide#1 (fb)) - When Hercules fought the UCWF in the ring, Dunphy and other wrestlers were swiftly defeated. (Thing I#33) - Dunphy and Thing sat in the crowd while they watched a wrestling match between Titania and Battleaxe, two of the new Women's Division of the UCWF. Dunphy was enthused as he watched Battleaxe win, then saw the Thing break up a fight between the two women. Thing didn't share Dunphy's plan to buy the women a beer after the match as he was sweet on Sharon Ventura. (Thing I#34) - While several women wrestlers watched, Dunphy and Thing sparred, and Dunphy grew frustrated when Thing got distracted. He suddenly found himself under the control of the Puppet Master, an old foe of the Thing's, and was forced to punch Thing repeatedly. When he knocked Thing down into the canvas, Thing took the opportunity to wrap Dunphy in the canvas, then went chasing after the villain while Dunphy regained awareness. Thing soon returned and helped free Dunphy, who advised Thing to give Sharon a bit more space. (Thing I#35) - Preparing to do a promo spot, Dunphy and Thing bantered while they put their costumes on. Dunphy avoided Thing's questions about his pills, claiming they were to calm his nerves. In front of the camera, they challenged their upcoming opponents, Grand Poobah and Mister Cheese, then relaxed. Dunphy grew concerned about Thing's frequent weak spells, then grew shocked when Thing went to find Sharon at the Power Broker's. He was unwilling to share his secret with Thing. Later, the Power Broker called Dunphy and demanded help with retrieving Sharon. Dunphy refused and was denied any more stabilizing pills. Thing found Dunphy later, huddled in the bathroom in full detox. Thing promised to send help. (Thing I#36) - Dunphy was taken to the hospital, where he stabilized. Later Sharon, now powered as Ms. Marvel, arrived to check in on the Thing, who'd been hospitalized. Dunphy told her that he figured the Power Broker'd been lying about those pills and that the Thing had never taken the pills. (Captain America I#328 (fb) - BTS) - Dunphy returned to work and trained with many incoming wrestlers. (Captain America I#328) - When Captain America arrived at the gym, several wrestlers, including Red Zeppelin, Sawbones, Lumberjack, Icepick, Jersey, and Steamroller, attacked him to test his strength. Dunphy soon broke up the fight, after ensuring that it was the real Captain America. He discovered that Captain America was looking for information on the Power Broker, and Dunphy rationalized that he could share anything with this hero. He invited Cap to the showers and explained his origins while they were there. Dunphy agreed to help Cap search through Garner's files of wrestlers to search for information on a man named Superpatriot that Cap was looking for. They agreed to meet up later that night to search the Power Broker's labs. 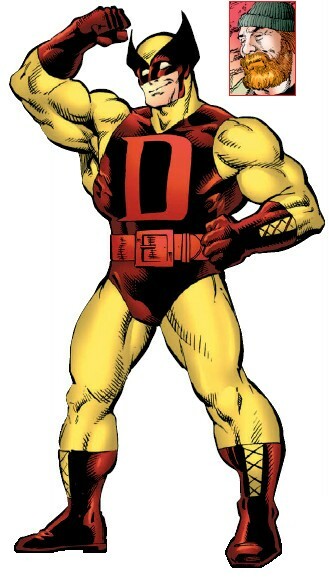 Dunphy eagerly cancelled his professional engagements, shaved his head, and had a costume made for him that resembled Daredevil's first one, as Dunphy had always admired Daredevil. They tracked down a local scientist, Karl Malus, who they believed might be involved, and started checking out his old residences. While eating, Dunphy expressed that being a hero wasn't as exciting as he'd expected and learned more about why Cap was after the Broker, as he wanted more info on his foe the Superpatriot. They spent more time searching for connections in gyms and other places, and Dunphy finally got lucky four days later. They drove to the building, an ice cream parlor, and Dunphy agreed to give Cap a 30-minute lead before he followed. In exactly 30 minutes, Dunphy rushed in, punching through a steel door and fighting off Mangler and Bludgeon inside. He freed Cap from an augmentation machine, then retrieved Malus for Cap. Cap considered getting augmented himself, but decided against it. They left Malus restrained, then looked around the place. (Captain America I#329) - After busting through a door into the boiler room for Cap, Dunphy went to get some food at a local diner. When he returned, he found the place overrun with Power Broker's augmented soldiers, the Sweat Shop. He knocked out a few on the way in, then drove their truck through the wall. He leapt from the car and was attacked by several men who soon overwhelmed him with their strength, knocking him out. They loaded him into a truck and took him to the Power Broker, knocking him out again when he woke up. (Captain America I#330) - D-Man was loaded into a machine that would increase his powers by several times, while next to him Ms. Marvel was having her powers removed. He burst free from the machine when Cap came in the room and madly lashed out in attack. After he lashed out with his super strength for several seconds, he collapsed in a heart attack, too much strain on his muscles. (Captain America I#331) - Dunphy was dying from his heart attack, leaving Cap to try and resuscitate him. Cap's allies the Shroud and Tick-Tock came in to aid him and they forced Malus to remove Dunphy's extra powers in another machine. After Cap fought off Lt. Michael Lynch and GI Max, Dunphy was soon taken to the hospital for recovery. Dunphy began to wonder if he wanted to resume his wrestling career. (Captain America I#332) - Cap called Dunphy, who was recovering in the hospital, to ask for advice on whether or not he should surrender his identity to the government or go to work for them. Dunphy was sure Cap would do the right thing. (Captain America I#336 (fb) - BTS) - Captain America chose to surrender his identity over to the government. He turned over his emergency hotline to Dunphy, who decided to put his wrestling career on hold and focus on being a hero. (Captain America I#337 (fb) - BTS) - Dunphy responded to four major alerts over the following weeks. He began looking for Cap, and had a new black uniform designed for him just in case. (Captain America I#336 (fb) - BTS) - Dunphy began worrying about Cap and initiated a search through the hotline operators for Cap's van. He also sent notices out to Cap's former partners, Nomad (Jack Monroe) and Falcon. Nomad took weeks to reach, but both heroes agreed to come out and talk to Dunphy. Falcon arrived late one night and heard about the quest. (Captain America I#336) - Dunphy greeted Nomad and his girlfriend, Vagabond, at his residence, and explained that he wanted to put his fortune to use in aiding Cap. Nomad was immediately standoffish and rude to Dunphy, who got Nomad to reluctantly agree to the quest as well. (Captain America I#337) - The foursome heard a report that Cap had been in Washington, and they went to look for him. They found a split in the road with Cap's van at the bottom of a chasm. D-Man climbed down by creating wedges in the stone with his fingers, then used his strength to toss the van up tot he road on its wheels. Though he felt weak and like he might be having another heart attack, he hid these symptoms from his allies and climbed back up. They camped out by the van for several hours discussing Cap and their connections to him until Cap himself came riding in on his motorcycle. He greeted them all and told them how Brother Nature had cracked the road open. When Cap said he was ready to be a hero again, Dunphy gave Cap his new uniform. They all loaded up into Cap's van and drove a ways before receiving a report that some snake-themed villains were holed up in the Gold Obelisk vault in Las Vegas. Using Dunphy's funds, they chartered a private jet in Portland and flew to Vegas, where Dunphy hired them a limousine to take them to the casino. When they arrived, they found out that the authorities didn't want their help, so they were all taken to the roof by Falcon to handle things on their own. Cap instructed them to hit the villains hard so the hostages could be saved quickly. They attacked quickly and the four villains (Black Racer, Copperhead, Fer de Lance, and Puff Adder) defended themselves. Dunphy punched through a window, hitting Puff Adder aside, and Puff Adder hit Dunphy with a full aquarium. As Dunphy prepared another punch, he was hit by Puff Adder's acid spit. The villains were soon defeated, though the police were furious with the heroes for intervening and threatened to press charges. (Captain America I#338) - Dunphy and the others waited in their holding cell while the police questioned Cap. Nomad grew more and mo re impatient while Dunphy expressed faith in the legal system. Cap finally returned while Nomad was taken for questioning. Soon Nomad returned and Falcon was taken. They were all shocked when Sidewinder, the leader of the Serpent Society, teleported in and started taking the captured snakes away one by one from their cell across the hall. Although Cap was reluctant, Dunphy bent the bars to their cell so they could stop Sidewinder, and only Fer de Lance was left. Sidewinder tried escaping, but Cap held on to him, though he let Sidewinder go when he threatened to kill Fer de Lance. The two villains escaped just as the police returned. (Captain America I#339) - While they departed in the private jet Dunphy had rented, on their way back to Portland, Dunphy talked to Cap about the bad dreams Cap'd been having. Dunphy confessed that hearing that a hero had doubts brought him comfort. They decided to take down the Serpent Society just before the pilot told them of an attack in America's breadbasket. The pilot agreed to take them there to repel it. When they arrived, they had to skydive out, an act that frightened Dunphy, and they found Famine attacking the land on her metallic horse. Falcon dislodged her, so Dunphy jumped on the horse to tame it. It seemed to have a mind of its own, so Dunphy had to punch it in order to crash it. Famine and the horse teleported away. (Captain America I#340 (fb) - BTS) - While Falcon and Nomad were recovering from the wounds they received in the battle against Famine and Cap was retrieving a new shield from Iron Man (Tony Stark), Dunphy retrieved the van and motorcycles and drove them down to California. He met his teammates and showed Vagabond some wrestling holds when she asked, making Nomad furious. (Captain America I#340) - Cap and Falcon broke up the fight between Nomad and Dunphy. Afterwards Dunphy admired Cap's new shield. As they moved to drive back to L.A., they heard about a disturbance at the Vault and got on their motorcycles to investigate. They were run off the road by Mr. Hyde and Titania (Mary MacPherran) in a van; Nomad was pushed over the edge, Dunphy managed to correct up the mountain wall, and Cap's cycle was hit. Dunphy went after the van and his cycle was hit by a projectile thrown by Titania, destroying his motorcycle. He was careful as he approached her, not wanting to hurt her, but she threw him from the side of the mountain. As he fell, he was overcome with fear, believing he was going to die, but happy in the fact that he'd left his fortune to Cap. Falcon caught Dunphy's legs, though, then had Dunphy hit the Griffin, who'd been attacking. Falcon deposited Dunphy, who couldn't believe he was still alive. He soon saw Titania running by, but chose to let her go, figuring his allies would never know. (Captain America I#342 (fb) - BTS) - Dunphy and the others returned to his residence while Cap completed a personal mission, returning his shield to Iron Man, who'd gone rogue. (Captain America I#342) - Dunphy showed Vagabond more moves in their free time and she started improving. Nomad caught them in a compromising position and hit Dunphy with a stun disc before starting a fight, but Vagabond broke it up by tossing Nomad into the pool. A Wakandan craft flew over them and Cap rushed out to retrieve a new shield that'd been made for him. They received a distress call from Diamondback (Rachel Leighton), who reported that the Serpent Society was in a deadly battle in upstate New York, and the Wakandan pilots K'Bali and M'Daka flew the heroes there to help. When they met Diamondback, they learned that Viper had led other criminals, including the snake-villains from Vegas, in infiltrating the Society, and that they'd poisoned some. Vagabond rushed Sidewinder to the emergency room as he'd been poisoned while Diamondback led the other heroes to attack. They were immediately attacked by Anaconda, Rattler, and Rock Python; D-Man and Diamondback worked together to defeat Anaconda. Soon Dunphy was attacked by Slither, but Nomad saved him. In time, Black Racer, Coachwhip, Cottonmouth, and Puff Adder were also apprehended, Asp, Black Mamba, and Bushmaster were rescued, and Viper and Cobra had escaped. (Captain America I#343) - To stop Viper, Captain America stowed away on her getaway ship, leaving his allies to pursue. With Diamondback piloting a second craft, Dunphy took Slither hostage to probe him for information while Falcon, Redwing, and Nomad watched. Though Dunphy was uncomfortable with it, Nomad used force to learn that Viper was poisoning the water supply of Washington, DC, so Falcon flew off to call the authorities. As they caught up to Viper's craft, Nomad wanted to fire a heat-seeking missile at it. Dunphy was very hesitant, but ceded to Nomad as he had more experience. They shot down the craft and learned that Cap had been on it, but Cap had managed to capture Viper. They decided to go to Washington, DC, to stop her plots. (Captain America I#344) - While Cap and Diamondback were apprehending Cobra, Boomslang, and Copperhead, Dunphy and Nomad kept an eye on Viper and Slither. Cobra rushed onto the ship and managed to free Viper with a shot, then evaded Nomad and Dunphy, causing them to crash into each other. Nomad blamed Dunphy, then rushed off to catch Cobra. While Dunphy was thinking either he or Nomad would have to go, Viper snuck up behind him and bit him with her poisoned fangs, causing him to collapse. Diamondback soon administered an antidote to Dunphy, then left him on the floor under a blanket, with the other snakes nearby captive. Dunphy awoke to see Battlestar aboard the ship and, assuming he was a villain, attacked. He grew weaker due to the poison, but put up a fight through the wall of the ship and into a statue before finally falling unconscious due to repeated blows. He, Diamondback, and Nomad were later returned to a holding cell in Washington, DC, in a secret Commission on Super-Human Activities base. (Captain America I#345 (fb) - BTS) - The Commission spent hours asking the trio about their activities, but none of them would give up information on Cap, knowing it was the Commission who had taken his uniform. (Captain America I#345) - They were shocked when Sidewinder teleported in with Vagabond. Diamondback escaped with Sidewinder, who soon returned for the others. D-Man refused to leave, knowing Cap would want them to face the consequences, and Vagabond agreed, but Nomad took the escape. (Captain America I#346) - Cooper, Rockwell, and Sikorsky of the Commission came to question Dunphy more, telling him he had no right to a lawyer and that they'd learned about his connection to Cap. (Captain America I#349 (fb) - BTS) - After being held prisoner for a few more weeks, the Commission let Dunphy go. He tried tracking down Cap, but could get no response on the hotline or through the Avengers. Finally, he went the Hydrobase, the headquarters for the recently defunct Avengers, and waited for Cap there. (Captain America I#349) - Dunphy hugged Cap tightly when he saw him, thrilled to see his old friend. He was impressed to hear about all of Cap's activities, then shocked and thrilled when Cap invited him to join the new Avengers team. Dunphy enthusiastically agreed. When Battlestar landed on the island in a helicopter, Dunphy still thought him a foe and attacked, but Cap quickly broke up the fight. (Captain America: Hail Hydra I#4) – D-Man joined a group of the Captain's Avenger allies to fight Hydra, Geist and reanimated zombies. Cap, Battlestar and Dunphy learned that the replacement Captain America (John Walker) was being held hostage by ULTIMATUM and Flagsmasher. After Cap confirmed some facts, he, Dunphy, and Battlestar took off in a Quinjet to the Arctic to stop ULTIMATUM. They arrived to see a seeming ULTIMATUM civil war brewing and Dunphy was left aboard the ship while the other two went to investigate. In time, Dunphy was shocked to see Cap board the ship with Flagsmasher, then they flew to the ULTIMATUM base. Dunphy was again left aboard the Quinjet until Cap instructed him to crash the Quinjet into the base, parachuting out before it hit. Dunphy lined the ship up with the target just as two ULTIMATUM soldiers boarded the ship back. He climbed onto the ship to stop them, still scared of heights since his battle with Titania, and tried to disarm the bombs they placed on the Quinjet. He couldn't get off in time and the ship exploded. Dunphy sank into the Arctic waters, no sign of him apparent. Cap, mourning, believed his partner dead. (Captain America I#384) - Cap heard a rumor of some Inuit men worshipping a man trapped in a block of ice in the Arctic. He rushed to check it out, thinking it Dunphy, but found nothing. As he left, an actual block of ice containing and preserving Dunphy floated up, but Cap didn't see it. (Captain America I#400/2 (fb) - BTS) - Dunphy thawed out and was discovered by the Inuit. He was brain-damaged, unable to speak, and had selective amnesia, though he could understand what others said to him after he learned their language. They took him in, calling him Redhair, and provided for him, giving him an igloo to live in. (Captain America I#400/2) - When Dunphy saw a ship fly overhead, he and his companions had to duck to avoid being hit. He chose to wander after it to see what it was, ignoring the pleas of his providers as he walked away. Two days later, he came across an ULTIMATUM base and, though the villains, including Flag-Smasher, were overcome by his body odor, they held Dunphy captive. Dunphy sat for days in a cell until Falcon rescued him and flew him free. They escaped on a Quinjet with USAgent (John Walker's new identity). (Captain America I#401) - Cap was thrilled when he saw Dunphy alive and embraced him, though he grew concerned about his friend's medical condition. (Captain America I#402) - Though still not responding, Dunphy cleaned up and worked out with Cap and the Black Widow (Natasha Romanova). (Captain America I#403) - Dr. Kincaid gave Dunphy a full physical and Edwin Jarvis looked out for Dunphy while Cap was on a mission. (Captain America I#404) - Jarvis decided to take Dunphy for a walk in Central Park, and they were joined by Bernadette Rosenthal. (Captain America I#405) - Jarvis had to run back to to Avengers mansion, so Bernie stayed with Dunphy, talking about how she'd been a big fan of his. She rushed off after a purse snatcher, leaving Dunphy standing alone. (Captain America I#408) - While sitting alone near the Central Park lagoon, D-Man was attacked by the D-Man Doppelganger, creation of the evil Magus, and knocked into the lagoon. (Captain America I#409) - The doppelganger choked Dunphy unconscious and left him to drown. He woke up in an underwater cavern, disoriented. (Captain America I#410) - Dunphy found a civilization of homeless people living in the cavern and calling themselves the Night People. They were surprised to see him and took him to one of their leaders, Brother Wonderful. (Captain America I#418 (fb) - BTS) - The leader of the Night People, Brother Have-Not, kept Dunphy in a cage for days, not feeding him, and sapping his super-strength with his powers. They tortured Dunphy for information, but Dunphy still could not speak. (Captain America I#418) - Dunphy was tortured again by Brother Wonderful, then thrown back in a cage as Sister Sweet and others watched. Young Jikjak came to Dunphy and brought him a drink, asking for help in turning against Have-Not. Jikjak explained that they'd all come to live there in Zerotown, but that they were nearly kept captive by Have-Not, who'd closed off the world above with a boulder and only allowed certain of the Night People to go to the surface. Jikjak let Dunphy free and he tried moving the boulder with his slowly recovering strength until Have-Not sapped it again. When Have-Not struck Jikjak, Dunphy spoke for the first time in years and told him to stop. Have-Not challenged Dunphy to prove himself by going on a surface mission with Brothers Broomstick, Glove, Post, Redeye, and Waycool, and Have-Not reluctantly agreed to let Jikjak come along. As they traveled, Dunphy learned that the homeless resettlers had once lived in a condemned uptown apartment building until their relocation. When Dunphy learned they planned to forage by robbing a store, he complained, but Have-Not tossed him through a window and sapped Dunphy's strength again while the others robbed. Dunphy sent Jikjak to retrieve Cap, then climbed to a roof to stand up to Have-Not from a distance. He threw things to keep Have-Not away until Have-Not knocked Dunphy off the roof. Dunphy's fall was broken by a lamppost, but Dunphy felt something break, likely a rib. Soon Cap arrived and Dunphy was able to get the drop on Have-Not. Dunphy told Cap that he was going to remain with the Night People and aid them. (Captain America I#422) - Dunphy went jogging with Captain America and invited him to see what he'd done with Zerotown, but Cap had to rush off on a mission. (Captain America I#440) - Cap, in a suit of armor, gave to Zerotown to ask D-Man (going by Brother D-Man) for help in a mission against AIM, but Dunphy declined, saying his people needed him. He was sad when Cap had to leave so quickly. (Avengers III#1) - When Asgardian threats threatened the Avengers, dozens of members combined to assess the threat. They gave Dunphy a wide berth, many put of by his strong smell from being unwashed. They split into five groups to assess the threats, and Dunphy teamed with Cap, Hercules, Quicksilver, Scarlet Witch, Quasar (Wendell Vaughn), and Crystal. They traveled to Tintagel Head, where their ship nearly crashed. D-Man went crashing into Hercules, who grew offended at his smell. Mordred the Evil revealed himself. He created stone warriors for the heroes to fight while kidnapping the Scarlet Witch. Morgan le Fey then revealed herself and remade reality in her image. (Avengers III#2 (fb) - BTS) - Le Fey remade the world as it was in Camelot, during the time of her early life. She ensorcelled the captive Avengers into being her guardians, giving them new identities as members of the Queen's Vengeance. D-Man was remade as Serf. (Avengers III#2) - When several of the Queen's Vengeance (alternate versions of Captain America, Photon, Wasp, Hawkeye, and Thor) regained their memories, they tried to make the others remember their true selves as well. Dunphy felt a stirring within him, but it did not last. With the versions of Quasar and Justice now on their side, these renegade Avengers fought free and went into hiding. (Avengers III#3) – Le Fey sent her forces after the renegades and battle opened between the two forces. Scarlet Witch began channeling her magic, seemingly resurrecting Wonder Man to do battle with Le Fey. The others started regaining their true memories, including Dunphy, who caught Moondragon when she was knocked out of the sky. The Avengers all channeled their wills through the Scarlet Witch to defeat Le Fey and reality was restored. (Avengers III#4) - Dunphy showered at Avengers Mansion, then took a bag of groceries that Jarvis offered. He bid farewell to Jarvis and climbed in the sewer to return to Zerotown. (JLA/Avengers#4) - D-Man was among the heroes pulled forth from time and space in the battle between the Avengers and Krona. (Avengers I#501) - When the Scarlet Witch went insane and caused several calamities to strike the Avengers, killing a few and destroying their mansion, dozens of heroes, including Dunphy, gathered to offer their help. (Avengers I#502) - After Nick Fury briefed the heroes on what was going on, they fought off a Kree invasion that the Scarlet Witch seemingly generated. Dr. Strange then appeared to explain everything that had happened. (Avengers I#503) - Strange explained the nature of the emergency and Magneto retrieved the Scarlet Witch for safekeeping after she briefly made the heroes fight each other. The Avengers officially disbanded. (Pulse#13 (fb) - BTS) - Dunphy's mental illness took a turn for the worse and he abandoned the Night People, going to live in the sewers by himself. He began seeing delusions, believing someone called the Cosmic Gamesmaster had instructed him to find the seven Infinity Gems by performing seven acts of heroism. (Pulse#12 (fb) - BTS) - Dunphy was briefly arrested for vagrancy, though he was soon released. He performed a few acts of heroism, stopping robberies, and then he took what he believed to be gems from the various stores, though he was collecting watches and jewels. The stores later reported these to be robberies, though many of them thought Dunphy was Daredevil because of his costume. (Pulse#11 (fb) - BTS) - Dunphy thwarted another robbery at Eugevnia's jewelry store. He asked Eugevnia for water, then stole another "gem" and rushed off. (Pulse#12 - BTS) - Reporter Ben Urich gathered information on D-Man and went down into the sewers to find him. (Pulse#13) - Dunphy was pleased to meet Urich, knowing he often wrote about Daredevil, but he had to touch Urich to make sure he wasn't just an hallucination. 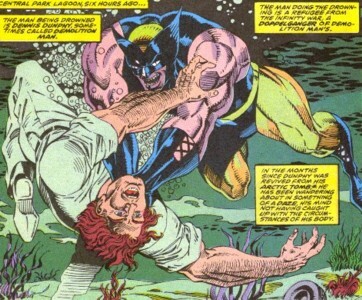 He asked about what was happening with Daredevil , then took Urich back to his small "home". He offered Urich a cupcake, next to a fire of candles, and acted shocked when Urich knew about the robberies. Figuring that the Cosmic Gamesmaster had sent Urich to him, Dunphy explained that he had five of the seven Gems, but Urich told him they were only jewels. Dunphy, embarrassed, rushed off. Later, Urich lead Daredevil to Dunphy. Daredevil invited Dunphy to go someplace safe and warm and Dunphy agreed. (Civil War: War Crimes#1 (fb) - BTS) - After the implementation of the Super Hero Registration Act, Dunphy went into hiding. An article in the paper appeared, titled "D-Parted, D-Man on the run after whereabouts revealed by unanimous tip." (Civil War: Battle Damage Report#1) - Tony Stark considered D-Man a potential Initiative recruit. (New Avengers#49 - BTS) - D-Man tried getting in touch with Norman Osborn, new head of the Initiative, but his audience was refused. (Marvel Assistant-Sized Special#1/1 (fb)) - While with a contingent of soldiers in Iraq, Dunphy tried to keep his identity a secret, but he used his super strength to save a truck full of soldiers when a house blew up. (Marvel Assistant-Sized Special#1/1) - The soldiers with D-Man (Aguilar, Bailey, Dinunzio, Kucynski, Leuchter) were upset he'd been hiding his powers. He trained them to act as heroes themselves and they busted up several enemy operations over the following weeks, developing a good reputation among the military men. When the military officers got upset over a ruined sting, D-Man backed out and went on to be a hero on his own, with Captain America in his thoughts. (I Am an Avenger#2/4) - After steeling himself up, D-Man attended the Annual Avengers Picnic to enter the pie-eating contest against Valkyrie, the Thing, and the Protector. After being coached by Steve Rogers, D-Man won the intense contest and was pronounced the victor as he collapsed on the ground, bloated. (New Avengers II#7) - Though highly eager to be involved, D- Man did not get the job of being Danielle Cage's nanny. (Avengers Annual III#1 (fb) – BTS) – D-Man believed the Grandmaster had called him to reclaim the Infinity Gems from the Avengers. 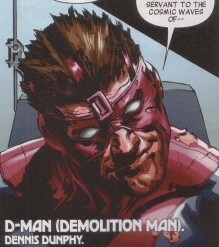 When they wouldn’t return his calls, he accepted Wonder Man’s invitation to join the Revengers, adopting a new costume. (New Avengers Annual II#1) – The Revengers savagely attacked Avengers Mansion where the team was overwhelmed by the shock of the attack. With support staff Victora Hand and Wong also at risk, the Avengers were swiftly defeated, with the Thing being the last standing and the mansion nearly destroyed. During the fight, D-Man kept begging the team to remember him. They then turned to Avengers Tower. 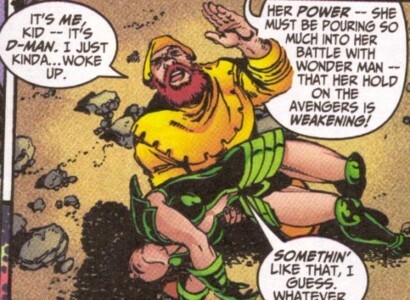 (Avengers Annual III#1) – The Revengers damaged the tower, then turned to give a media report on the Avengers’ failings. The Avengers attacked, quickly containing Wonder Man, then they teleported the Revengers to Citi Field, where the villains were swiftly defeated. They were each interviewed about their motivations. (Captain America VI#13 (fb) – BTS) – Hydra agents restored D-Man’s ability to think clearly, but then brainwashed him into becoming the new Scourge. They put a brainwashed Henry Peter Gyrich in charge of him and sent him to murder criminals who had entered Witness Protection. (Captain America VI#11 (fb) – BTS) – Scourge killed a former Hydra agent. 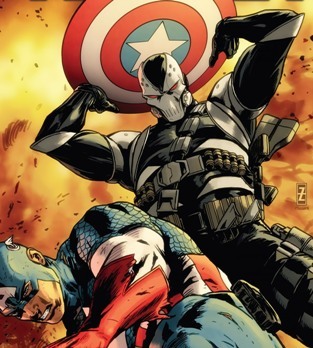 (Captain America VI#11) – Scourge killed former AIM agent Paul Winston. He later attacked Leon Murtagh, the Viper, and killed him, also wounding SHIELD agent Diamondback. (Captain America VI#12) – Scourge trained, feeling guilty over Diamondback, but Gyrich convinced him to continue. He later hunted down and killed Rattler. Rational thought started coming back to him. (Captain America VI#13) – An angry Scourge demanded that Gyrich fix his brain, but Gyrich activated a device that stripped Dunphy of rational thinking again. (Captain America VI#14) – Dunphy attacked Roger Gocking, Porcupine, who was saved by Captain America. Scourge and Cap battled savagely and Scourge nearly killed Cap before Sharon Carter gunned him down, apparently killing him. (Secret Wars Too I#1/4) - On Earth-616, a minor mystic (man in purple jacket with glasses) used a book called the Official Handbook of the Monster Underverse” to try and summon a demon, but he accidentally summoned D-Man instead, restoring him to life. 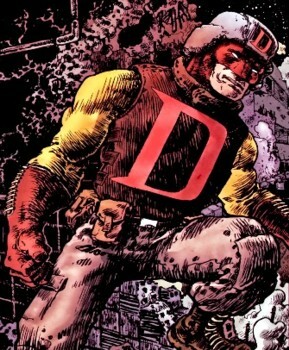 D-Man got pies, disrupted a robbery by the Serpent Society, got positive feedback from Edwin Jarvis (who spoke for Captain America) at Avengers Mansion, then wrestled alongside Rage at the U.C.W.F., before the final incursion hit and was restored as Battleworld. In Doomstadt, Emperor Doom and Sheriff Strange welcomed Baron Dunphy of Demolition House, but he was eating Doom’s Pies. (Captain America: Sam Wilson I#1 (fb) - BTS) - Sam Wilson became the new Captain America and formed a support organization to help him be more effective. D-Man began working behind the scenes as a pilot, technician, and back-up field operative, and he donned new body armor as his costume. Sam also began working with Misty Knight, and his bird Redwing. (Captain America: Sam Wilson I#1) - D-Man helped Cap and his allies battle Hydra aboard a Helicarrier. (Captain America: Sam Wilson I#3) - D-Man worked with Misty, Captain America (temporarily transformed into a werewolf), and the Whisperer to track the Serpent Solutions team. 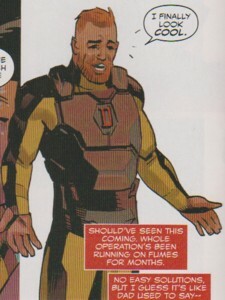 (Captain America: Sam Wilson I#4) - D-Man promised to take a shower when the werewolf Sam Wilson smelled him. (Captain America: Sam Wilson I#5) - D-Man watched over Falcon, using games sent by Gideon Wilson (Sam's brother). (Captain America: Sam Wilson I#6) - D-Man helped Cap, Diamondback, and Misty Knight defeat the Serpent Solutions team. He saw that the new Falcon was equipped with body armor. (Captain America: Sam Wilson I#9) - D-Man helped defend Captain America on social media. He later attended a press conference with Cap, where Cap defeated Chance. (Captain America: Sam Wilson I#11) - Alongside Cap and Misty, D-Man reviewed the new threat of the Americops. (Captain America: Sam Wilson I#13) - D-Man filmed a statement from Captain America (Sam Wilson) on the Americops and how he would be monitoring those active in New York City from now on. (Captain America: Sam Wilson I#15) - After defending Cap on social media, D-Man agreed to appear in a UCWF revival, staged by new manager Jim Jay McMahew. With Sam, Falcon, and Rage watching him, D-Man put on a replica of his Demolition Dunphy uniform, kissed his boyfriend, then appeared on stage to fight Battlestar, though he'd been hesitant to do so. When McMahew and the Power Tools tried robbing the box office, D-Man helped stop them. He later watched the show on TV with his boyfriend. (Captain America: Sam Wilson I#18) - D-Man helped Sam review footage of Rage's recent arrest. (Captain America: Sam Wilson I#21) - D-Man rebuilt properties with Gideon Wilson. (Captain America: Sam Wilson I#22) - After Hydra took over the country, D-Man and Misty Knight helped Cap smuggle refugees, including Inhumans, across the borders to safety. (Spider-Man II#18) – D-Man hung out at the emergency room reading Howard the Duck comics. (Unbeatable Squirrel Girl II#29) – D-Man was briefly summoned along with other heroes by Loki to help Squirrel Girl in a fight against Silver Surfer on the planet Chitt-crrt. He was soon sent home. (Lockjaw I#1 (fb) – BTS) – D-Man and his boyfriend Chris broke up; though they'd been happy, D-Man refused to work on his flaws in the relationship and expected unconditional love in return. D-Man's sister Ruth, after a bad divorce, moved back to New York from Arizona. They planned to spend more time together but didn't see each other much. (Lockjaw I#1) – In his apartment, D-Man spent days eating pizza, drinking and watching television. When his name was used in a game show and no one knew the answer, he punched the television before remembering he no longer had his powers. Mrs. Gillespie came to visit with her puppy Bixby (who looked like a smaller version of the Inhuman Lockjaw) then headed to the emergency room to treat his hand. Rufus rushed to check on him, having thought he'd attempted suicide, and D-Man began to realize how bad he looked to his loved ones. Back at home, D-Man found Lockjaw outside then they were attacked by flying hamsters in tiny airships full of offensive weaponry, with names like Snowball 1, Skitter-Foot 19 and Cutie-Beans 7, there to attack Bixby (revealed as one of Lockjaw's relatives) on his 30th birthday but the hamsters fled when Lockjaw fought back. D-Man then followed Lockjaw to the Savage Land, where they met Ka-Zar and Zabu. (Lockjaw I#2) – D-Man, despite his huge crush on Ka-Zar, saw his home and terrible farm, and they soon fended off the attacking Beast Pack, led by another of Lockjaw's relatives, the Beast. D-Man stopped Ka-Zar from hunting the Pack then went off on the next adventure with Lockjaw. (Lockjaw I#3) – On Larval Earth (reality-8311), D-Man and Lockjaw teamed with Spider-Ham to defeat the Wrecking Zoo then met Doc Jaw, Lockjaw's cartoonish sister, who shared that Annihilus was after Lockjaw and his family. She gave D-Man an inhaler to use later. To find the truth, they sent D-Man and Lockjaw into the Mindscape dimension, where he saw a monstrous version of his seventh-grade teacher, Mrs. Kowalczyk, then met Sleepwalker and his dog Dogwalker. (Lockjaw I#4) – In the Mindscape, Lockjaw was able to see the truth of his origins in memories, how in utero he had been experimented on and how he had teleported four of his cloned siblings to safety before his birth; those four including Beast, Doc Jaw, Bixby and a fourth who was in the Negative Zone. After passing back through the Larval Earth, Lockjaw and D-Man went to the Negative Zone to save the final dog, who was being held by Annihilus. D-Man's asthma acted up and he used the inhaler, which turned him into a dragon man capable of flight and breathing fire. Lockjaw began teleporting them to various places during the following battle, including Asgard, Duckworld, the Ultimate Universe, a "world between worlds," a foreign universe (resembling the DC Universe) and one million years into the past, where Annihilus was eaten by a giant shark. D-Man returned to his normal form then was sent back to New York City. He embraced Ruth then noticed that the dog from the Negative Zone was now his to keep. 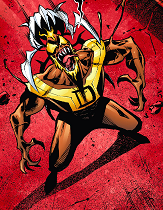 (Venomized I#2) – On the Manhattan Bridge, D-Man and Rage were aiding panicking civilians when a group of Poisons from the Hive attacked, including Killer Thrill, Gamora, Thing, Hyperion, and Spider-Woman; Rage and D-Man were swiftly overwhelmed by their symbiotes, then Poisons infected both of them, converting them to the Hive. (Venomized I#3) – The Hive battled the assembled Avengers and Champions, many of them now bonded with Klyntar, including Captain America, Hercules, Thor, Falcon, Ms. Marvel, Thing, and Nova. D-Man felt a sense of belonging, and berated Cap for never making him fully welcome before. More Poisons arrived. (Venomized I#5) – D-Man and Rage were freed from their Poisons and symbiotes when the Poison Queen was defeated. Comments: Created by Michael Carlin, Ron Wilson & Kim DeMulder. 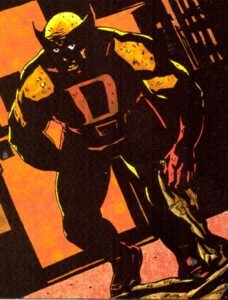 In the Hulk vs. Hercules one-shot, Dunphy is mistakenly portrayed in his D-Man costume instead of his wrestling garb. Special thanks to SQUEAK for his help with D-Man's first two appearances. D-Man received an entry in the Official Handbook of the Marvel Universe Master Edition#18 and All-New Official Handbook of the Marvel Universe#3. Thanks to Ronald Byrd for pointing out D-Man's Civil War appearances. 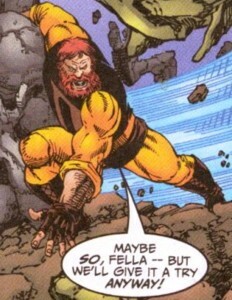 Thanks to Shiryu for pointing out D-Man's appearance in JLA/Avengers#4. Although seemingly delusional in Avengers III#1 Annual, he nevertheless recognizes seven Infinity Gems (see Nemesis), which is probably the first time the seventh Infinity Gem has been cited post-Ultraverse. (Lockjaw I#1 (fb) – BTS) – Ruth Dunphy (affectionately called Rufus by her brother Dennis) broke up with her husband in Arizona. After a difficult divorce, she moved back to New York City, where she hoped to see her brother more often. (Lockjaw I#1) – Ruth went to check on Dennis, who had recently broken up with his boyfriend, after he cut his hand while punching the television. (Lockjaw I#3) – Ruth went to visit Dennis and met his neighbor, Mrs. Gillespie, and her dog Bixby. (Lockjaw I#4) – Ruth hugged Dennis when he returned from an adventure and saw that he had a new dog. (Thing I#34 - BTS) - Grand Poobah and Mister Cheese were two of the wrestlers for the UCWF. The Thing and Demolition Dunphy challenged them in a promo before the fight. Grand Poobah and Mister Cheese presumably possessed greatly enhanced strength, likely as a product of the Power Broker and Karl Malus' machinations.